I thought I wrote this months ago. In fact, I remember writing key turns of phrase months ago. Maybe I wrote them on scrap pieces of paper, or on the notepad of a now dead 'smart' phone. Wherever they are, they are gone. And while my memory of writing them lingers, the actual phrases are now obscured by the dust of an unreliable brain. 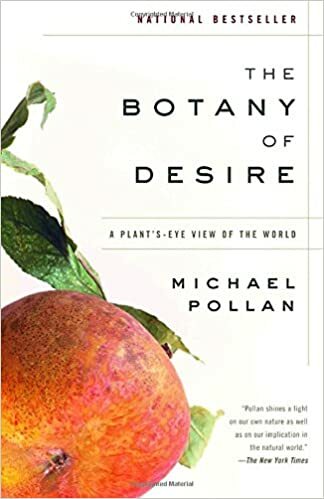 Michael Pollan, famous sibling and bally-hoed food writer, has a keen and interesting interest in the intersection of botany and culture as it shows up in our eating habits. For this exploration Pollan dedicates each of the four chapters in his book to four crucial plants in the development of western culture: the tulip, the potato, the apple and marijuana. They are an interesting lot, chosen for their appeal to riches, beauty, nourishment, and escape. I find Pollan's writing style engaging; his blend of science, social study and gastronomy really works for me. My only strong resistance to this book came from his rah rah Americanism in the section regarding apples. I hate jingo-ism at the best of times, and the supposed claim America has on apples strikes me as false as a starlet's buxom breasts or a Texas dame's big blonde 'do. That said, the history of the apple in America, being grown first and foremost for cider until prohibition caused the apple lobby to invent that whole "an apple a day" thing, was interesting. I do love my cider. And it tied the apple and prohibition nicely to the intriguing chapter on marijuana, the big oil lobby that destroyed hemp as an industrial crop. and the underground growing that has resulted in marijuana plants that deliver more high in smaller plants. From the money-grubbing Dutch Rennaissance tulip bulb hoarders to Monsanto potato farmers, Pollan's research weaves a clear narrative of how humans have influenced plant evolution and vice versa. If only Johnny Appleseed wasn't so wrapped up in Old Glory. Something weird happened this book club - which I'm really having to stretch to remember. Some of us were going to go on our annual retreat, but that didn't happen. Some met anyway but I was protesting the lack of retreat (a.k.a. chopping off my nose to spite my face), didn't go, and don't remember hearing how it went. I guess this is still a 'book club review' even though I wasn't at the meeting. I will say that of all the lofty goals we started book club with, retreat was one of my favourites and it's disappointing that we've only managed to retreat once. With the constant stream of new babies (8 in 3.5 years) it's hard for members to get away. It's totally understandable but still disappointing. My dad is not the man I think I know. He is a mystery - a much cherished, little understood ideal. Or what makes a joke funny. Or how many raisins make a bran muffin perfect. flaring bouts of righteous indignation. He is a model few men since have measured up to. My dad is not a photo I can find of us together. Those are a few frozen moments - not even the most important ones. He was most often behind the camera, both making and preserving the stories for us. My Dad is not a memory of tangled fishing line on a riverbank. Or a pink Jeep on a hillside. Or holding hands to pray around the dinner table. Or car trips of just us and miles filled with quiet or deep talks or Sunday School songs. My dad is not a monolith or bunting made of adjectives. He is superlatives and caveats and contradictions in balance. He is as soft and as strong as leather. He is "oh, Shan" and quick tears and being heard and "that's enough." I have worn proudly all my life the honour of being his daughter. I have rarely felt up to the role. I have known to my bones he feels otherwise. Well, that was more difficult than I expected. When it came right down to it, coming up with 100 things that made my eyes light up or my heart beat faster took a little thinking. I got to 50 pretty quickly, then another 10 here or there, and finally took to reading other people's lists to find my final 10. And then, because some of those lists are awesome, I ended up with 102. One of the things that strikes me is how limited the 'Nurture Romance' section is for me. I don't know if that's because I am resigned in that area or because so much of what I do dare to dream about romance I'm too chicken to commit to paper/blog. Little of column a, little of column b and lots of room to grow, I guess. So, here it is - my list of 102 dreams. And now for the fun part - making them happen! Attend the Academy Awards - inside the building! I turn a-shocking-number old on January 30, 2018 and am determined to make that decade sizzle! I've gotten away, of late, from reviewing the books I've been reading. I have a considerable back-log of reviews waiting to be posted, but I wanted to get this one up first since I have a feeling that finishing this book is a line in the sand of what life looks like moving forward. The book in question is Chris Guillebeau's The Happiness of Pursuit, the second of Chris' books I've read since returning home from Jamaica clear that my sleepy hometown isn't going to be enough anymore. In The Happiness of Pursuit (THoP) Chris hangs a framework of lessons from his own quest (to visit all 193 recognized nations of the world by the age of 35) and the quests of many others. Within that framework Chris inserts questions and lessons that have you pay attention to life for what your (my) own quest might be. THoP is a relatively quick read that I purposely slowed down. I wanted each lesson to sink in. I wanted to really learn from Chris, from the woman who created a meal from every country in the world, from the man who refused mechanical transportation for 22 years, from the other creators and explorers. What about what they did called to me? What in their stories was inspiring? What might my version of that look like? Chris is a very readable writer - intelligent, self-deprecating, pleasantly insouciant, and very very relatable. He often answered my questions just as they were forming, and he leaves plenty of room for people to create their own lives rather than imposing his ideas of life on his readers. As I read I was repeatedly reminded of something that I've often felt is a weakness of mine - not having one singular passion that pulls me forward. I like variety. I am interested in many things. And the idea of hitching my chariot to one questing star feels limiting rather than inspiring. As I read THoP I paid extra attention - what in life holds my attention? Where and when do I feel myself getting excited about an undertaking? What activities make time disappear? What circumstances outrage me? The answers are a mixed bag. Obviously, travel is and will continue to be a theme for me. But as I pondered the various forms a quest can take, travel seemed like - pardon the pun - the vehicle, not the focus. I'm going to travel anyway, but what can that travel be about? What happens in the life I have at homebase? Where do my sons, my parents, my health fit in in a life focused on travel? And then, I came across this blog post on Facebook: Don't make a bucket list; make a list of 100 dreams. I was on my iPhone, and I don't enjoy reading articles on that screen so I simply saved it and moved on. I had pondered the headline the last few days - a list of 100 dreams. I detest the concept behind bucket lists, but a list of dreams inspires me. In his books Chris calls these kinds of lists "Life Lists" and while that's an improvement, it's really the dream list idea that moves me. So imagine my surprise when I finally went back to see the article I'd saved and it links to Chris' website. Oh, serendipity, you charmer. Of course the ultimate link is not Chris' blog but this sample list. read any and all of Chris Guillebeau's books. They are accessible and inspiring and there's something in there for everyone (review of The Art of Non-Conformity coming soon). I found my quest not in the book itself, though reading the book plowed the earth so that finding the list of 100 could land in fertile soil - this week I'm working on my creating my list of 100, and then I'll begin crossing things OFF my list of 100. A quest of plenty - what fun!